A tunnel finishing system suited for small or remote installations where a high pressure boiler system is not available nor desirable. The “Wizard” technology (patent pending) uses a built-in steam generating unit to eliminate the need for an external boiler to supply the steam for fabric relaxation. 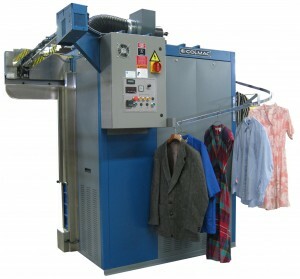 In the small OPL (on-premise laundry) this effectively replaces the boiler, piping, water feed systems and chemicals, a dryer, and a main garment press.